Home + News + What Should Be Stored in a Flammable Storage Cabinet? Almost every business and industrial facility uses flammable chemicals. Operations, maintenance or cleaning divisions need to store and use these chemicals daily. In auto shops, mechanics use cleaning solvents, battery acid, anti-freeze and coatings. There are also many ignition sources present in the workshop environment. Welding equipment, tools, and car engines create sparks. Safe flammable chemical storage is critical to prevent fires and injuries. Machine shops use large quantities of oil-based coolants. All oil-based products are flammable. Finished products are often sprayed with coatings to protect them from rust. But, these coatings are also flammable. 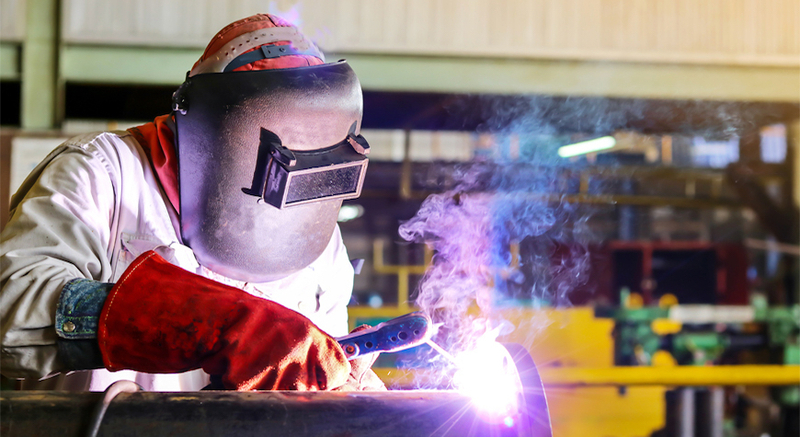 Grinding, cutting, welding and torch cutting generate sparks and heat in a machine shop. Safety cabinets help segregate these ignition sources from flammable materials. What Can Be Stored in a Flammable Storage Cabinet? Flammable storage cabinets safely store flammable liquids and chemicals. The OSHA 1910.106 standard defines flammable liquids by categories based on their flash points. The NFPA 30 fire code classifies flammable liquids by flash point, but it also includes classifications for combustible liquids. Safety cabinets can hold up to 60 gallons of Category 1, 2, or 3 flammable liquids. The limit rises to 120 gallons for Category 4 materials. What Can’t Be Stored in a Flammable Storage Cabinet? Some chemicals are not flammable themselves but act as accelerants when exposed to fire. Oxidizers release oxygen thus intensifying a fire. Do not store incompatible chemicals together to prevent a reaction and potential explosion. Using the wrong storage container inside a safety cabinet can also be problematic. Seal lids properly. Use the same material as the original packaging (e.g. amber glass). Do not store paper-based packaging materials like cardboard inside a cabinet. They can become soaked with spilled chemicals leading to a fire hazard. RELATED ARTICLE: Where Should Chemicals Never Be Stored? Employees may leave safety cabinet doors open as they use chemicals during the day. Justrite SureGrip EX Flammable Safety Cabinets with Self-Close Doors provide advantages for those situations. Fusible links hold the doors open. If a fire occurs and ambient temperatures reach 165 F (74 C), the links melt and the doors close automatically. Justrite understands flammable storage cabinets keep employees safe and reduce the risk of fire. Made from double-wall welded steel, each cabinet comes with a 10-year limited warranty. View all our flammable storage safety cabinet options.